Sharing ideas around the world is now so much easier. Can this serve to create greater respect and understanding? When I started writing this blog my motivation was largely centred on providing a platform of discussion for the students with whom I work in Bangalore. I must confess that I was a reluctant blogger in the early stages of this process. I had been encouraged by colleagues at the university who are far more in tune with the digital age than I am, or ever will be. Over the course of a relatively short time it became apparent that a much broader circle of people were either regular or occasional readers of my ramblings, and it is always interesting to see the comments that people post in response to what I say, or read the email messages from those who appear not to have the confidence to post their ideas on line. The successful outcomes of this electronic exchange made me reflect upon the generosity of spirit that characterises teachers working to create more inclusive approaches to teaching. Not so many years ago it would have been almost impossible to elicit a response to a call for help or advice from people all around the world. Yesterday’s series of responses demonstrates how there is now a shared commitment to address issues, about which we are all concerned and to enable teachers and children to make progress towards a more inclusive education system. Every day I receive an electronic report indicating from which parts of the globe individuals have logged in and accessed this blog. To date people from 94 countries have accessed the blog (though I suspect that many stumble upon it by accident and never return!) 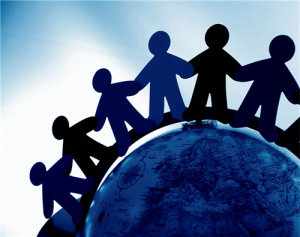 In England in recent years we have discussed the notion of creating communities of learners, where individuals with common interests come together to share their experiences and ideas for the benefit of a wider community. Yesterday’s reactions indicate to me that there are many people around the world who share a desire to create an inclusive community of learners for support of those who work with marginalised children. My simple focus for today is therefore to say thank you to all of those teachers, parents and students who have indicated a willingness to share their knowledge, learning and experiences, and to help others who have a similar commitment and focus. It is through such generosity that we can have hopes to create schools and education systems that benefit all learners. Do please keep sending your replies and sharing your knowledge, experiences and expertise with others. Dancing together to the same inclusive tune. Inclusion through dance. 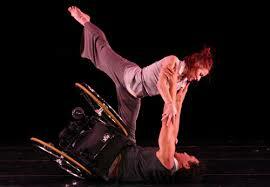 A shared vision achieved with grace and skill by Axis Dance Company. One of the pleasures, though also sometimes one of the challenges, of supporting MA students as they work on research towards their final dissertations, is that they sometimes tackle subjects that introduce me to a whole new range of literature. Being encouraged to read papers and chapters that I would not necessarily have encountered were it not for a student’s interests, is most certainly a benefit that comes with this job. An example of this has been exercising my mind over recent weeks since my return home from Bangalore. Whilst many of our students there have opted to address areas of inclusive schooling or support for children with special educational needs with which I am familiar, and fairly confident in terms of my knowledge of the literature; one of our students has decided to conduct her research into the use of dance as a means of increasing the sociability and confidence of the children in the special school where she works. This is most certainly an area outside of my usual comfort zone, though one where I already feel I am beginning to learn and ask questions. The student concerned is a confident and very well organised teacher. Her work on the course, both in respect of her writing and her participation in class has been excellent. Furthermore, she keeps in touch, regularly reporting on her progress and asking questions at every stage of the process. She is already devising innovative approaches to recording dance lessons through the use of video recording that involves her pupils, and considering how to manage the data she is collecting. Her approach to working is well considered and professional and this makes my job as her tutor relatively easy. Having chosen to research an under investigated area, especially within an Indian context, one particular issue has presented a number of challenges. A systematic search of data bases has revealed a limited corpus of literature dealing with this area. Very few researchers appear to have done work on the application of dance for children with complex learning needs, and much of what has been published has little by the way of an empirical or theoretical foundation. The limited number of papers that have been found have been analysed and discussed by my student with her usual attention to detail, but still there remains an ambition to find anything else that might be out there. (If you know of anything do please post the details in reply to this blog). As is usual in such circumstances I have drawn on the resources of my colleagues, asking their advice and seeking any knowledge that they might have of dance for children with special educational needs. Several have made suggestions, but little has been retrieved that adds to the work already found by my student. However, as is often the case in situations such as this, further opportunities for learning have arisen during this process. Hearing of this dilemma, a former student emailed me today, not with advice regarding literature, but telling me of an experience she had a few years ago when a dance company visited Dartington Hall in Devon. She drew my attention to a YouTube video which shows some of the work of Axis Dance Company, a group of whom I previously knew nothing. Founded in 1987 Axis Dance Company describe themselves as a physically integrated contemporary dance and education organization. They are based in California and specialise in choreographing dance that brings together able bodied and disabled dancers. Their work has won many national and international awards and they have an enviable reputation for their education programme. Having read about this interesting company of performers and spent an hour watching recordings of their work, I am struck by the respect for individuality and commitment to inclusion that they have achieved. The available recordings of their performances demonstrate the sublime beauty of movement accomplished by individuals working in harmony with creative imagination and skill. The power of dance and the demonstration of physical excellence is achieved through high levels of collaboration and the development of total trust between the individuals involved. I suspect that having had my attention drawn to the work of Axis will have done little to assist my student in search of further literature for her study. However, this is indicative of the incidental learning and opportunities for widening of our horizons that often accompanies our work in education. Whilst you are enjoying these breath-taking performances, I must return to assisting my student in attempting to find further literature to help her with her studies. So much of what is on television today appears trite and banal. This is a shame, because at its best television can be a powerful medium for entertainment, information and education. With so many channels to choose from it would be easy to assume that there would always be something of interest to see, but perhaps it is simply my jaded palette that leads me to find much of today’s television content disappointing. Having made this sweeping critical generalisation about the world’s favourite media, I have to confess that from time to time a programme is broadcast on our screens that leaves an indelible impression and cannot be easily shaken from the memory. Just such a programme featured in the television schedules last night; a documentary so thought provoking and desperately sad that it was the first thing I thought about this morning as I awoke. “Dancing in the Danger Zone,” sensitively fronted by the reporter Evan Williams and produced for Channel 4, tells the story of the Baghdad School of Music and Dance, the only arts based school remaining in the troubled country of Iraq. In particular it follows the daily routines of two young students, Leezan an elegant and articulate ballet dancer and Mohammed a gifted musician, and the stresses that are part of their daily lives and that of their families. Both of these students express their search for excellence in their chosen discipline, and a determination to achieve a performance as close to perfection as they can possibly manage. Their enthusiasm and commitment portrays the most fundamental features of the relationship between teaching learning and passion for their chosen subject that characterises the best qualities of education. If these two young people were in school here in England they would be widely admired for their talent, dedication and endeavours, but they would probably not have attracted the attention of documentary makers. The appalling reality of this programme was that it focused as much upon the dangers that these gifted young people face simply in attending school, as it did upon their artistic accomplishments. Early in the programme Evan Williams makes the astounding statement “Leezan could be the last ballerina in Iraq” and commences to describe how religious fundamentalism and sectarian violence has challenged the legitimacy of the performing arts within the country. The graceful movements and subtle expression of ballet so greatly admired around the world, have been illegitimately equated by religious zealots to acts of immodesty and even wantonness. Powerful clerics have deemed that acts of performance, whether these are of dance or music are ungodly and sinful and they have therefore sought to banish these from the country. At one point in the programme Leezan tells Williams, “Inside the school everything is beautiful,” she then goes on to describe why there are armed guards posted at the school gates and the reasons why she never talks about attending this school, or her love of dancing to anyone. To do so could put herself and those she loves in danger. Mohammed in a tearful interview shows a poster he made to commemorate the life of his friend Ali another talented musician, who also attended the school, and was killed by a bomber. We see him play a Chopin nocturne with great tenderness, it was apparently one that Ali particularly liked and Mohammed states that when he plays it “I feel he is still around.” In a moving passage he describes in a stilted and choking voice his sadness at not being able to attend his friend’s funeral because he was from a different religious community and would not have been welcome in the area. The irony of this is clear, Mohammed is from the Sunni community and his lost friend Ali was a Shia yet they were best friends. These young people appear more willing to cross boundaries and learn to understand and respect their different backgrounds and beliefs than those who currently rule the country. During the programme we are shown the homes and families of both of these students. Their families express both their determination to support their children in pursuit of their dreams, but also share their anxieties for the dangers they face every day simply for attending the school. There are now only two ballet teachers remaining in Baghdad, both recall earlier days when the school flourished and performances were eagerly awaited by the public. Now such a public display of talent would endanger the lives of students, teachers and any who cared to support them. The statement made by Evan Williams in the film that “each day here is an act of defiance” is chilling when one considers that this description is being applied to a school. Equally disturbing is the belief expressed by both students, that in order to pursue a career in the arts it will be necessary to leave Iraq. Iraq is a country that was home to the great poet Muhammad Al-Jawahiri, the painter Faeq Hassan and the musician Nasseer Shamma who is well known as a peace activist working in support of the people in that region. These individuals and many like them continue to bring joy and understanding into the lives of people across the world, of all religions and none. It is hard to believe that there are some in Iraq who would wish to repress the creativity of such individuals and deny the dreams of gifted students such as Leezan and Mohammed. School years should be a time of learning and joy, a period during which young people are encouraged to discover their talents and hone their abilities. This happens in situations where students are enabled to think freely, express their ideas and share their interpretation of their world with others. Wherever there have been efforts made to suppress creativity individuals and groups have found ways of defying and overcoming the regimes that fear the abilities of creative people to express their views, whether this be through the written word, music, dance or the production of visual art. I hope that in the future we may hear more about Leezan and Mohammed and others like them from Iraq as they enjoy successful artistic careers both within and outside of their homeland. I am equally hopeful that the good people of Iraq, who undoubtedly form the majority in that country, soon enjoy a return to the peace and stability that allowed a flourishing of free thinking and creativity throughout earlier periods of their history. 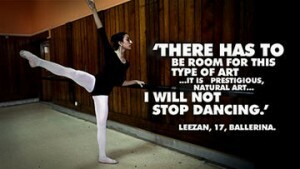 Until such a time arrives, as it surely will, we must be grateful to journalists such as Evan Williams and those who support him for the making of programmes such as “Dancing in the Danger Zone,” which ensure that the plight of young people like Leezan and Mohammed are brought to the world’s attention. This is television at its most relevant, which makes even this most cynical of viewers sit up and take notice. Do visit the website below to find out more about the extraordinary young people mentioned in this blog.